Disneyland may be your main destination, and it has plenty to offer for a fun family getaway. You'd be remiss, however, to skip over all the other cultural offerings in Los Angeles and Orange Counties. It could be a pit stop along your road trip to Disneyland Resort, a side attraction on your way back home, or an additional day of fun during an extended vacation. Whether driving or flying, there’s plenty of fun to be had along the way to Anaheim. Here are some more adventures to fill up your family excursion. Thousands of travelers fly into Southern California to see the "Happiest Place on Earth," often using Los Angeles International Airport (LAX) as their base. This major travel hub is located roughly one hour from the park. Fortunately, there are some fun stops along the way. Located just to the northwest of Anaheim, Knott's Berry Farm in Buena Park is another of California’s beloved amusement parks. This one offers a water park, rides, multiple kids’ areas, and live shows. If you can spare an extra day, this park is worth adding to your agenda. If you can spare some time, follow the 405 to the 110 or the 710 down to Long Beach before heading to Anaheim. There you can enjoy ocean views, the Aquarium of the Pacific, or The Queen Mary—an historic ship and modern-day hotel. Route 1 is arguably America’s most beautiful drive, providing more than 650 miles of coastal views, whether you’re breezing past the majesty of the Redwood Forest or taking in the sights of surf capital Malibu. If you drive it through Southern California, this scenic route is full of world-renowned stops. Depending on how far north your trip begins, you may start in the Bay Area and spend the whole day driving. Just south, you can enjoy the beautiful Monterey Bay, which houses a world-famous aquarium, or enjoy stellar vistas of Big Sur. When you see a sign for San Simeon, prepare to stop. This is the site of Hearst Castle, the breathtaking estate and museum of newspaper tycoon William Randolph Hearst. 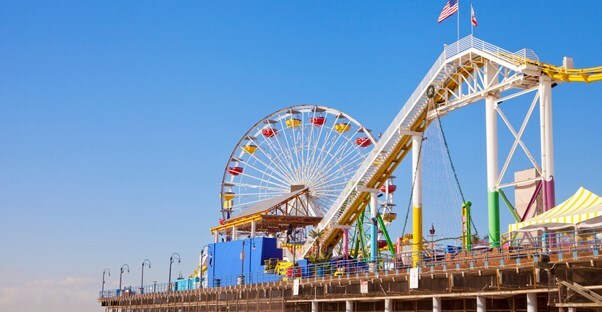 Once you reach Southern California, stop through Malibu and Santa Monica before heading inland to Anaheim. You won’t be sorry, and you’ll get to visit some of the nation’s most iconic beaches. If you’re taking Interstate 5 into Anaheim, you’re in luck. There’s great fun to be had along this major thoroughfare. Heading northwest from the park, the heart of downtown Los Angeles is an easy stop where you can catch a concert or Lakers game at the Staples Center after a day at the park. Or check out some of the area’s great restaurants for some dinner on your way home. If you love to shop, visit the enormous Citadel Outlets—modeled after an Assyrian palace—which offer more than 100 designer stores and restaurants just southeast of L.A. In between the outlets and Disneyworld, you’ll hit Santa Fe Springs—home of some of the first Los Angeles-area missions. Use an additional day to take a family-friendly tour of its ranching museum, or visit the Historic Railway Exhibit for a glimpse of the past. If you’re headed south, be sure to take a slight diversion to visit Limestone Canyon Regional Park, offering beautiful hiking trails and wildlife on a natural preserve. Certainly, Disney dominates this Southern California city, but there’s plenty to see after you've visited Sleeping Beauty Castle. Grab a baseball ticket, and see one of California’s star baseball teams fewer than five miles away when you visit Angel Stadium. Or, you can catch a show at the Art Deco-inspired City National Grove of Anaheim where internationally renowned acts come to perform. Make the most of your next trip to Disneyland by embracing all that the Southern California region has to offer, but remember—save some energy for the main event. As much fun as getting there can be, half the fun—or more—is the destination itself. Rod Welch is the President of HotelGuides.com, a website that helps travelers find places to stay near all sorts of U.S. and Canadian attractions. He has been a travel agent since 2002 and loves traveling to new destinations.